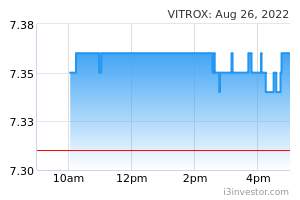 Vitrox Corp Bhd is an investment holding company. It develops vision inspection system and printed circuit board assemblies for microprocessor applications. A major part of its revenue is generated from the company's Malaysia region. Its products include Vision Inspection System; Tray-based Vision Handler; Advanced 3D Solder Paste Inspection System (SPI); Advanced 3D Optical Inspection System (AOI); Advanced 3D X-ray Inspection System (AXI); Electronic Communication System and V-ONE. *Sincere_Analyst*(The Best Analyst) you guys just like to attack me for being sincere? I purposely did that and knew you are here to find fault, not really care to clap for me and give credit when I am sincere to make ppl that align with me to huat. Hypocrite, earn money diam diam no give credit yet find fault want to shut me up. UnicornP Wah Sincere goreng Vitrox! *Sincere_Analyst*(The Best Analyst) bad counter with bad qr. Sell and don't fall in love. going to $5 soon. *Sincere_Analyst*(The Best Analyst) earn 4% within 1 week is good enough to give CNY angpau. newages00 why drop so much? *Sincere_Analyst*(The Best Analyst) told you, bad result and this stock cannot touch. those that bought $8, must be in holland selling salted duck egg now. qqq3 Vitrox....no other ( or very very few) local company more innovative, more relevant to Industrial 4.0, more flexible, more competently managed. organic growth and mergers and acquisitions to increase total addressable market and technological breakthrough. opportunities brought about by the Industrial 4.0. Depeche The charts here are looking very bullish. HoldingKing Helo all, anyoneknows who is the competitor of Vitrox? (2.6m shares buyback April ) Philip Qqq3 when you started position in vitrox? Recently? Interested in looking at it more. longkor88 Cognex and Keyence are not their competitor. In fact, they are the suppliers for 0097. One of the competitors that is doing well in market is Kohyoung (Korea) that actually occupied 50% of the SPI market in the world. Qqq3 when you started position in vitrox? Recently? Interested in looking at it more. There is no compare in Malaysia......can u imagine 3 USM graduates doing so well in machine learning, machine vision, automation...spends a huge amount of annual budget in R & D.........Fund manager dream stock......manufacturing 4.0.....where got limit one? qqq3 Vitrox will have a better 2019.
qqq3 Vitrox.........results flat PE 30.................but people buying......why? (2.6m shares buyback April ) Philip Hmmm, results not flat leh. They did extra 10 million revenue this quarter. But their profit margin is consistent. I think not bad la. I suspect ( not sure) if someone goes to them during the AGM and ask a direct question, if they lose the Pioneer status today, will they be competitive tomorrow, you may have an interesting answer. I take the example of mikro MSc, a Sabah company and good friend of mine. They were also enjoying 20+% profit margins on a very good niche product ( only protection relay and power meter manufacturer, designer and supplier in Malaysia), which they exported to Vietnam and Africa. They enjoyed it until end of 2017, when their profit margins suddenly became very much affected due to Pioneer status lost, 24% income tax being introduced (from0%), benefits from duty import and levies all gone. You can see what the net effect was on the stock and earnings. Now I don't know if the same thing will happen to VITROX, as I'm not smart enough to judge how big the market is, how capable VITROX is at competing with international market, or even what their basic competitive advantage is, ( Location? Quality? Price? Reputation? R&D?) What is so special about VITROX anyway versus the Korean competitor? What's the extra secret sauce? As far as I can tell, what VITROX has is nothing the industry has not seen before, except that they sell it much cheaper. Their production times are quite long for a machine, and it's quite new in the market so won't know the reliability of it but it seems quite popular especially in USA. Problem is I don't see it in big wins like supplying to big company like intel, tsmc, lg, etc etc which can be used as a marketing tool. I don't know if income tax will effect it or not in the future, but time will tell. (2.6m shares buyback April ) Philip For me this part unnatural. No need to pay income tax? If so, is a great business strategy, buy sadly unsustainable. Wong7446 Today Strong support ,go ahead..
Wong7446 Vitrox prepare to up again..
Vitrox prepare to up again..
jzkidding Really or not? prove?